Preheat oven to 375°F. In a large mixing bowl, combine the cauliflower, shallots, tomatoes, and bay leaves. In a separate bowl, combine the water, oil, lemon juice, turmeric, sweet paprika, cumin, salt and pepper. Drizzle over vegetables and toss to coat. 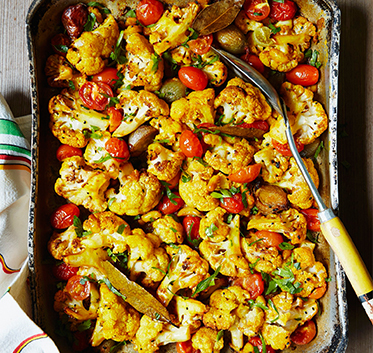 Roast in preheated oven for 40 to 45 minutes or until cauliflower florets are golden and caramelized. Sprinkle chopped parsley over the top and serve.